After playing draw against Nepal, the Indian women’s national team registered a 7-1 win against Bangladesh in their second match of the 2020 AFC Women’s Olympic Qualifiers Round 1, held on Sunday at the Thuwunna Stadium in Yangon. In Sunday’s match, out of the total 7 goals scored by the Indian team, which includes 6 players from the northeastern State of Manipur, six goals were scored by two players from Manipur. While Manipur’s Bala Devi, who is the Indian captain, top scored 4 goals, another player from Manipur, Kamala Devi scored 2 goals. India’s Sanju scored another goal for India making it to 7-1. With this results, India remain unbeaten in the competition with four points from their two matches so far. In the first half, the game started off evenly but after the opening goal from India, it became a one-sided affair as an eight-minute blitz featuring three goals completely left the Bangladeshi players shell-shocked. Team India coach Maymol Rocky’s side that created the first chance of the match as Ratanbala Devi’s effort from the top of the box went wide in the fifth minute, stated a match report by AIFF Media Team posted on the official website of the All India Football Federation (AIFF). After six minutes, Bangladesh forward Mosammat looked to be through on goal but Dalima Chhibber produced an inch-perfect tackle inside her own box to remove the danger. Having played out a draw against Nepal in their first match, the Indian team was looking to respond in style and 16 minutes into the contest, they opened the scoring from the spot. Captain Bala Devi was brought down by the Bangladeshi left-back inside the penalty area and Kamala Devi, who was the lone scorer of India in the previous match, made no mistake from the spot as she slotted her kick low to the keeper’s right, who could not reach it despite guessing the correct way. As per report, Bala Devi had another chance to score but her shot was blocked at the very last moment in the 17th minute. It was Bala Devi who successfully converted an excellent cross from the right by Grace Dangmei and opened her account during the encounter. Bala, in the very next minute, was able to add another to her kitty as she stunned the opposition defence with an absolute rocket of a shot from 30 yards that left flew in even before the keeper could react. Bangladesh had a chance of their own in the 28th minute but India could have had a bigger lead by half-time as Ratanbala Devi’s long-ranger in the 42nd minute hit both posts and went straight into the goalie’s arms. The players were welcomed back onto the pitch by a heavy downpour and while the showers came and went in the second half, the Indian side continued its goalscoring run. Four minutes after the restart, a looping effort came back off the upright and the rebound, hit by Kamala, was saved. In the 53rd minute, she added a second as turned in a cross from the right flank after the Bangladesh defence failed to clear the ball away. The 62nd minute saw Bala complete her hat-trick as she tapped the ball into the empty net after Sanju broke free down the left and unselfishly passed the ball across goal as she closed in on the keeper. After few minutes Bala Devi picked up her fourth goal. The Bangladesh side picked up a consolation goal with 10 minutes to go as Krishna Rani scored from a tight angle to deny the Indians a clean sheet. Meanwhile, in a video, Bala Devi and Kamala Devi have thanked the Indian viewers for their support towards their team and also to the coach. 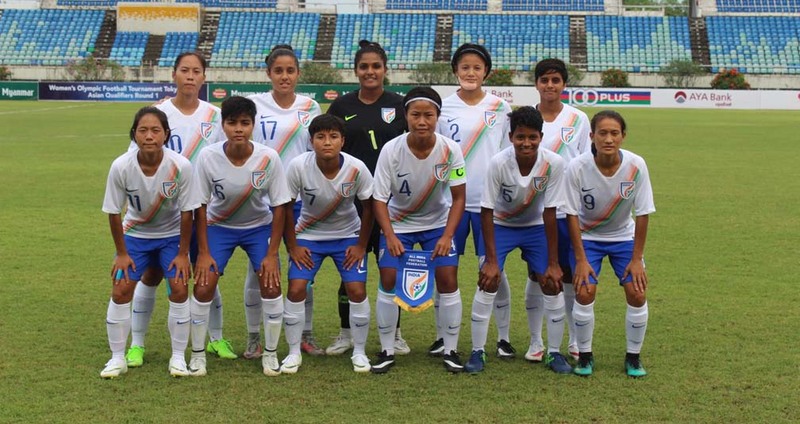 India (Starting XI): Bala Devi (Manipur), Kamala Devi (Manipur), Sweety Devi (Manipur), Ashalata Devi (Manipur), Aditi Chauhan, Jabamani Tudu, Sangita, Ratanbala Devi (Manipur), Sanju, Grace Dangmei (Manipur), Dalima Chhibber.